Irish salmon is unquestionably some of the best in the world, if not the best. The recipe for a whole poached salmon adds a buttery sauce with fennel, always one of Ireland's favorite herbs. Place the poaching liquid in a saucepan and bring to the boil. Simmer for 15 minutes and leave to cool and strain. Clean and (if necessary) gut the salmon. Place in a long fish poacher and add enough of the poaching liquid to just cover the fish. Place the poacher on the stove, bring to the boil and then simmer. Cook for 8-10 minutes per pound. About ten minutes before cooking is complete, remove from the heat and allow to finish cooking in the liquid. The fish should feel firm to the touch but easily pierced with a skewer. 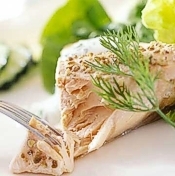 Remove the salmon when cooled slightly, reserving liquid. Peel the skin from the middle of the salmon, leaving the head and tail ends in place, and decorate with wisps of fennel. Meanwhile, to make the sauce: Combine the strained poaching liquid and wine in a saucepan, add the shallots and bring to the boil. Simmer until the shallots becomes tender. Remove from the heat and add the cream, then return to the boil. Remove from the heat and allow to cool slightly. Slowly whisk in the butter the cold butter, piece by piece. Heat only over a very low heat, and only if needed. When all the butter is combined, bring the sauce just back to the boil, whisking constantly. Remove from the heat and whisk in the chopped fennel. Season to taste. Serve with the sauce and boiled potatoes, seasonal vegetables or salad.